The Global Woman P.E.A.C.E. 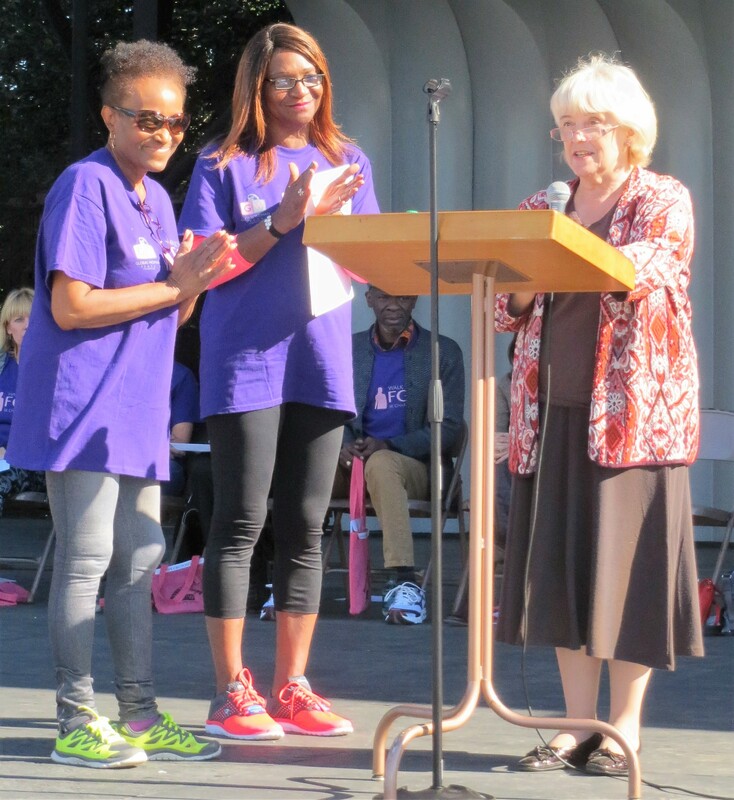 Walk-A-Thon to End FGM, in Washington DC on 15 October 2016, brought together many activists from around the world – an exciting and truly inspiring experience, which I describe in more detail here. I am deeply grateful for this honour, and I want to acknowledge all the people who have made it possible…. Those whose work I have drawn on and those, some of them here today, who have so generously allowed me to use their stories of courage and determination. Every one of you deserves massive thanks for what you do. So what can I offer at this point to help end FGM? I have one idea to share. It costs nothing and it could happen right now. When we talk formally, discussing this harmful traditional practice in professional and similar forums, let’s abandon the words ‘cutting’ (or indeed ‘circumcision’) and call FGM what it is – female genital ‘mutilation’. Of course we will continue to use informal terms sometimes . Many different communities have many different words for FGM. But in policy and formal dialogue only one word is accurate … mutilation. This is the term which women leaders demanded strongly that we use when they wrote the Bamako Declaration in 2005. And ‘mutilation’ is also the term which Dr Morissanda Kouyate of the Inter-African Committee on Harmful Traditional Practices insists we must employ. I know that sometimes vernacular language is appropriate. Other terms than ‘FGM’ must sometimes be used to achieve effective communication and clarity. But the time has come to deny for ourselves as activists and thought leaders the comfort of euphemisms. Let’s drop the use of language which softens our horror of FGM, and speak the truth we know. – and, much more importantly still, FGM is a grim abuse of the human rights and futures of the defenceless children on whom it is practised. Let’s stop the pretence that the act of FGM is in the end different from other forms of child abuse. Let’s stop protecting ourselves in formal contexts from the reality that FGM is a truly hideous crime. Polite terms, euphemisms, show disrespect to those activists who have for the last decade demanded that we tell it as it is. Perhaps if, consistently and clearly, we call FGM ‘mutilation’ more of our leaders, who have the influence and power to change things, will insist urgently that the time for action has come. health and well-being of communities anywhere. What we don’t want is the comfort of the 5th E – Euphemisms. Don’t let’s permit, for ourselves in formal contexts, the comfort of words which diminish the horror of FGM. As Susan Masling, an attorney working to end FGM and one of our distinguished speakers today, has already said, FGM isn’t ‘FGC’; it’s mutilation. Until we call it as it is, we are not doing our best to protect those who so desperately need protection from this terrible crime. THANK YOU again for honouring my books; and thank you all for your work to #EndFGM. Pending further notice (of a planned new blog, sometime later in 2016? ), discussion of the general issues re M/FGM will not be published unless they are posted on this dedicated page. Thanks. Hi Hilary, the walk-a-thon looked amazing! I’m now “friends” with Angela P and enjoyed reading her stuff including her letter to Ellen Sirleaf-Johnson. Just flicked back thru some of your articles and was reminded of a Guardian article recently concerning Semenya Caster, the South African athlete who is apparently “hyperandrogenic”. I’m passing the baton to you if you don’t mind to research it cos I was deeply shocked by the fact that some athletes found to have higher levels than normal of testosterone have been coerced into taking drugs to reduce said levels to allow them to compete, then the most shocking bit, have had their clitorises cut! It was the fact that FGM has been practised in US and UK up to and beyond 1950,s that reminded me of the article. We’re still at it! Hilary couldn’t be more right. Yes, courtesy will govern private conversation, and good writing, to avoid repetition, will also deploy a variety of terms, but public speech and policy deliberations should avoid language that trivializes and understates the reality best descried as mutilation and, often, torture. See Kiminta, for instance … Maria Kiminta and Tobe Levin. _Kiminta. A Maasai’s Fight against Female Genital Mutilation_. Frankfurt am Main: UnCUT/VOICES Press, 2015. Including Tobe Levin. “Critique of anthr/apologists observing a Maasai rite.” 116-126. Wonderful Hilary. Good Job !! Bravo !! Delighted that you like it, Morissanda. Thank you!